Item is new in the box from dealer stock and has never been removed from the original packaging. The last photo is stock. Others are of the factory sealed item you will receive. Please message us if you have questions. 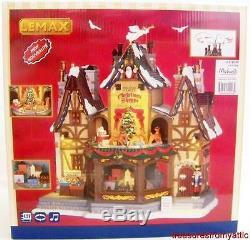 Lemax HOLIDAY HAMLET CHRISTMAS SHOPPE 55026 Sights & Sound NIB Santas Wonderland. This addition to Santa's Wonderland is simply oozing with holiday cheer. 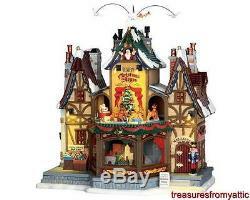 Item Name & Item #: HOLIDAY HAMLET CHRISTMAS SHOPPE #55026. Year(s) Produced: Current Production Released 2015. Materials: Hand-painted Porcelain and Plastic. Measurements (W x D x H): 11½ x 7 x 11. Input is 120vAC 60Hz; Output 4.5vDC 1A (draws approx 350mA). Lighting, Animation w/ Volume-controlled Soundtrack (English only). Extras: Multi-lingual instruction sheet included for easy setup. Inspection Report: (identified defects, if any, are listed below). Item Overall Condition: Never Removed From Box (NRFB). Condition of Packaging: Excellent / Factory Sealed. This collection continues to be inspired by personal memories of Lemax artists and is influenced by seasonal traditions. All this awaits you inside the Lemax Santas Wonderland Collection with its buildings and accessories just oozing with Holiday Cheer. Please read the fine print below. We pack items carefully but cannot be responsible for their care or loss once they are picked up by the carrier. Generally, these charges are accurate for a single item. Their combined invoice automatically charges that amount regardless of the size of box needed to combine items. If a larger box is needed, the price will increase accordingly. All items are described to the best of our ability. We have been collectors for a long time ourselves, so we try to look at each individual piece as if we were acquiring it personally. All sales are final unless an item is grossly misrepresented in the listing. Once the return authorization is generated, you will have fourteen (14) days to return the item. That item cannot be resold under the NRFB classification because value is lost by the act of opening the sealed packaging. We have attempted to supply a scale for grading the items that appear in our auctions. It follows further down in this section. We take great pride in offering a fine assortment of collectibles from many varied and creative sources; however, we are not experts on every item we sell. Therefore, our descriptions are based in part on information provided to us from a number of different sources, including consignors, outside experts, and reference guides. We are happy to provide whatever information that we have available. As much as 24-36 hours may be needed to answer your enquiries. Please examine all photos carefully. They are provided to give the best representation of the item that is possible. If requested, additional photos can usually be provided. Props may be used in photographs and are not included unless specifically identified. Used Items : We carefully describe each used item to the best of our ability. Cosmetic appearance typically leads to very subjective grading and condition estimates. Items are inspected before listing and are completely operable and without damage unless specified in the listing. If you receive an item damaged, please be sure to retain ALL original packing material until a claim has been made with the shipper. Never Removed From Box (NRFB) - The Manufacturers seal has NOT been broken; no human hands have touched the item since it left the factory. These items are never removed from the box (NRFB). They are NOT tested with regard to operability and all parts are presumed to be included and unbroken. Condition of item is presumed to be perfect. We do NOT inspect or photograph these items. Stock photos are used for these listings unless packaging needs to be shown. New In Box (NIB) - Item is not sealed but was NOT pre-owned and was never displayed, has no breakage, chipped paint, crazing or missing parts. If originally manufactured with lights, animation and/or sound, these functions are fully operational. Mint In Box (MIB) - Item was pre-owned and was seemingly displayed; however it has no breakage, chipped paint, crazing or missing parts. If originally manufactured with lights, animation and/or sound, these options are fully functional. Excellent Used Condition (EUC) - Item has been used, but is still in good working order. While some wear may be evident, no major pieces are missing or broken (could require a bit of re-gluing). Item may be a bit dusty. If originally manufactured with lights, animation and/or sound, these functions MAY NOT be fully operational. These items are not eligible for return. Good (G) - Item has been used and shows some wear. Marks or scratches may be evident. Item is not broken beyond usage, but may have a more serious flaw, such as a large, prominent chip, a missing part that cannot be included in the box, lack of sound, animation and/or lighting, or crazing. If an item has been repaired, it falls into this category. A box or sleeve may have shelf wear or some Styrofoam scuffs, but no significant flaws unless specifically identified in the listings Item Description and/or photos. We will make every effort to answer all questions as quickly as possible. Since we sell many items on consignment, occasionally we need to speak with the consignor to get an accurate answer for you. An appropriate response to your request may take 24-36 hours. We hope all your shopping experiences with us are happy ones. Get Images that Make Supersized Seem Small. Auctiva's Listing Templates improve your auctions in minutes. Attention Sellers - Get Templates Image Hosting, Scheduling at Auctiva. The item "Lemax HOLIDAY HAMLET CHRISTMAS SHOPPE 55026 Sights & Sound NIB Santas Wonderland" is in sale since Tuesday, May 09, 2017. This item is in the category "Collectibles\Holiday & Seasonal\Christmas\ Current (1991-Now)\Villages & Houses". The seller is "treasuresfromyattic" and is located in Gilbert, Arizona. This item can be shipped to United States, Canada, United Kingdom, Denmark, Romania, Slovakia, Bulgaria, Czech republic, Finland, Hungary, Latvia, Lithuania, Malta, Estonia, Australia, Greece, Portugal, Cyprus, Slovenia, Japan, China, Sweden, South Korea, Indonesia, Taiwan, South africa, Thailand, Belgium, France, Hong Kong, Ireland, Netherlands, Poland, Spain, Italy, Germany, Austria, Russian federation, Israel, Mexico, New Zealand, Philippines, Singapore, Switzerland, Norway, Saudi arabia, Ukraine, United arab emirates, Qatar, Kuwait, Bahrain, Croatia, Malaysia, Brazil, Chile, Colombia, Costa rica, Dominican republic, Panama, Trinidad and tobago, Guatemala, El salvador, Honduras, Jamaica.